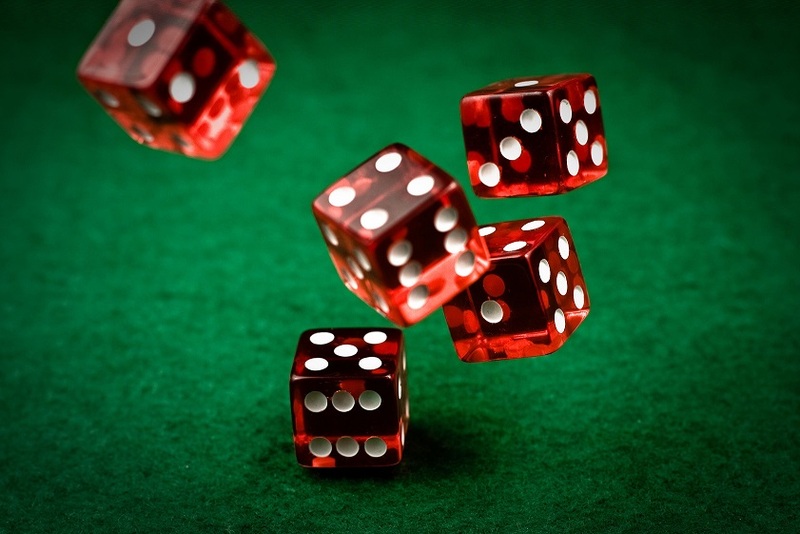 Dice have been an integral part of gaming for centuries. They’re the simplest way to introduce randomness to a game. The six-sided die is, by leaps and bounds, the most familiar die. 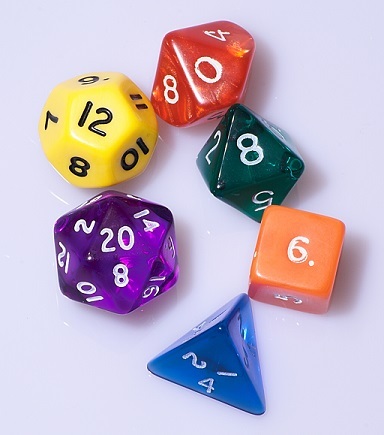 The d6, as role-players call it, is a staple of classic board games like Yahtzee and Clue, as well as the centerpiece of role-playing systems like GURPS. But the d6 is hardly the only kind of die you see in gaming. 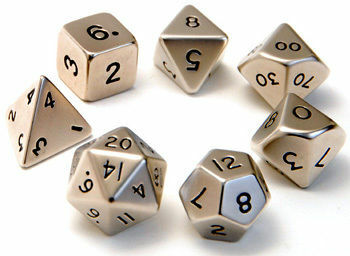 Plenty of games and role-playing systems rely on dice of other shapes in order to run smoothly. If you play World of Darkness role-playing games like Werewolf or Vampire: The Masquerade, then the d10 is your friend. If you enjoy updated editions of Dungeons & Dragons (or even board games like Unspeakable Words or Scattergories), the d20 is a familiar sight, whether it has letters or numbers on it. A standard dice set for beginners Dungeons & Dragons contains six different dice shapes: a pyramid-shaped d4, a d6, a d8, a d10, a d12, and a d20. (Many come with 2 d10s, one with single digits and one with double digits, allowing you to calculate percentages). Heck, if you think about it, flipping a coin to decide something is simply rolling a two-sided die. But when you start delving into the history of games, it’s amazing to see just how far back some of these traditions and conventions go. 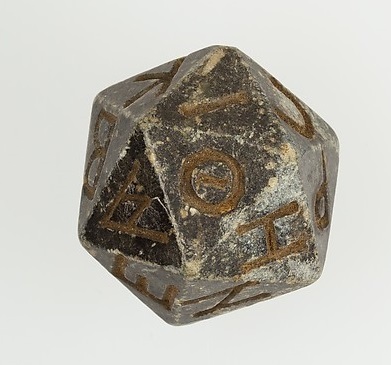 Did you know that The Metropolitan Museum of Art has a d20 in its collection? Dating back to Roman times (somewhere between the 2nd century BC and the 4th century AD), the above die is inscribed with Greek letters. It’s not certain if this particular die was used for games or religious divination, but there’s no doubt it’s a beautiful example of craftsmanship. And this is just scraping the surface. One of my favorite dice in my collection is an oversized 3D-printed d20 with Braille markings for every number. Such a cool piece. This entry was posted in Games, PuzzleNation, Puzzles and tagged Clue, coin flip, d20, dice, die, DIY puzzling, Dungeons & Dragons, Dungeons and Dragons, games, Geeking Out, greek die, Instructibles, Instructibles.com, metropolitan museum of art, Pop culture, Puzzle history, PuzzleNation, Puzzlin' fool, puzzly history, role-playing, roleplaying, rolling dice, roman empire, Scattergories, Unspeakable Words, vampire: the masquerade, werewolf, world of darkness, Yahtzee by gmdirect. Bookmark the permalink.